When you’re a creative business owner, it’s not uncommon to find yourself working from sun up to sun down. You’re the boss, which means you have to make sure everything gets done, from accounting, to working with clients, to blogging and social media. It’s crazy how many hats you wear. And with the never ending list of tasks comes a long work day. Or at least that’s what it usually amounts to. But I’m here to tell you that that’s not necessary. Sure if you want a successful business, you need to get stuff done and put in the time, but if it means sacrificing your health and well being, then it’s not worth it. And in the end, failing to care for yourself will likely cause your business to suffer. That’s why creating a work life balance is so incredibly important. 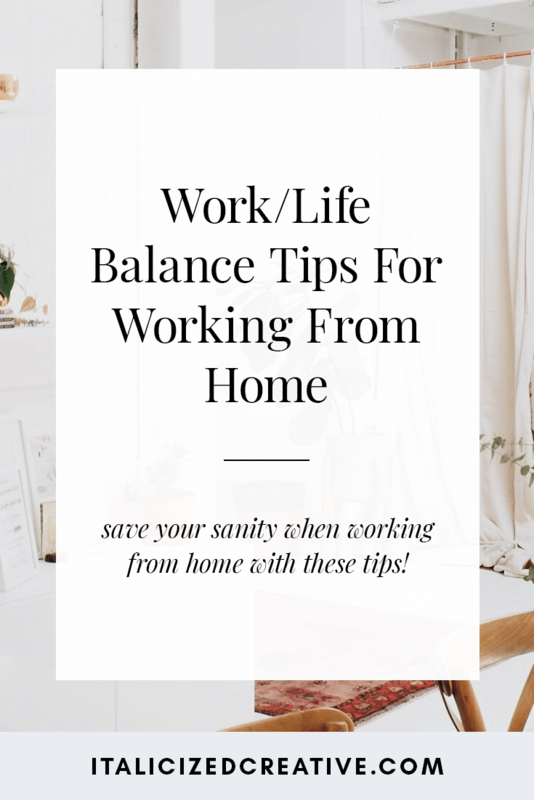 Here are 6 ways that you can create a work life balance working from home as a creative business owner. When you work outside the home, you usually have a schedule. You’re expected to be in work at a certain time and you have a time allotted for a lunch break. You even have a set time when your work day ends. And beyond those work hours, you probably fall into a routine. Your mornings are filled with getting ready for the day, while your nights are spent cooking dinner, running errands, and catching up on your favorite TV shows. Now compare that to working from home as a creative business owner. You begin work one day at 8am and the next you don’t get started until 10. Then there’s that day you worked straight through til bedtime, forgetting to eat a lunch and only snacking for dinner. Without a set schedule, it’s incredibly easy to let work consume you. If you find yourself working all day, forgetting to eat, or lacking free time, then you’re in need of a daily schedule. As your own boss, it’s important to set some guidelines for when your day starts, when it ends, and when you get to take a break. If you’re anything like me, your to do list is never ending. Besides your client work, there are so many things going on behind the scenes, from blogging, to scheduling social media, to updating your website. It’s easy to get overwhelmed and feel like you must tackle it all right this minute. But take a second and breathe. Look at your to do list. How many are “crucial, I must do this or I won’t get paid” tasks vs “I should do this” tasks? Don’t get hung up on the shoulds. Instead, prioritize and focus on the musts. These are the things that are important to keep your business going and cash coming in. Everything else is nice, but not mandatory. Focus on the most important tasks and let everything else slide, at least for now. Because your time is limited and we’re trying to create a work life balance, you’re going to have to pick and choose what gets accomplished. And that’s okay. There are only 24 hours in a day, even less when you consider having a life outside of work. Don’t overwork yourself trying to cross everything off, because like it or not, your to do list will never be complete. When you finish what you thought was your last task, more will pop up. So you’ve created a schedule and you’re enjoying your free time. But what good is your free time if you’re checking emails off the clock? In order to get the most out of your work life balance, it’s important to fully leave your work at work. And unlike those who work a typical 9-5 and can leave a building and come home, it’s going to be more difficult to fully leave work at work. Your schedule should include office hours, which is when your clients know they can get a hold of you. Once those hours are up, step away. That email isn’t urgent. It can wait until the next business day. I know it’s hard to disconnect and ignore your inbox all weekend, but let me tell you, it’s so worth it. To prevent yourself from checking in outside of your office hours, disable notifications on your phone. Or use my favorite, Inbox Pause, which pauses your inbox so you don’t see new mail coming in. If you’ve got emails under control, but clients keep calling you, get a Google Voice number. When you’re not working you can set it to do not disturb mode. It’s important to remember that in order to fully disconnect and not leave your clients in the dark, you must inform them of your office hours. I have mine listed in my email signature. Another great place to put them is in your contract. That way, clients know exactly what they’re getting into when working with you. For many of us, our small businesses started out as a hobby or something we were passionate about. And while it feels amazing to spend your working hours doing something you love, it’s important to have interests outside of work. Otherwise it’s easy to find yourself working 24/7 as there’s no delineation between work and play. So pick up a book, go for a hike, see your favorite band live. The goal is to give you something to look forward to. Think about this: if you worked in an office, you’d probably be happy for the work day to end so you could head home to relax and have fun. Working from home doesn’t give you that luxury of coming home and fully shutting work out. But if you knew that once the clock strikes 5pm you could go for a run or get creative in the kitchen, it would give you the sense of punching out and having down time. A a small business owner, it’s easy to work day after day, with little to no time off. After all, everything rests on you. If you don’t do something, then it will never get done. Taking time off seems like a luxury you can’t afford. But here’s the thing. You need time off. It’s important for both your well being and your creativity. While you might feel guilty and/or lazy taking time off, you shouldn’t! Many traditional jobs include vacation time. Just because you work for yourself doesn’t mean that the same rule doesn’t apply. Be a great boss and give yourself some vacation time. Even if you don’t take an actual vacation, it’s still awesome to sleep in and lounge around the house for a day. I’ve been known to take days off just to go shopping. And on days when my head just isn’t with it, I “call in sick” without guilt. Don’t be afraid to take time off for you. Your business needs you healthy and well rested in order for it to thrive. As I mentioned earlier, when you work from home, you don’t have the advantage of leaving work at the office and coming home at the end of a long day. However, that doesn’t mean you can’t create your own “office.” If your living arrangement allows, set aside a room solely for work. That way at the end of the day you can simply shut the door and be off the clock. If your home doesn’t allow for that, set up your workspace in a corner. The key is to give yourself a workspace that’s for business only. If you’re really set on creating the ultimate work life balance in terms of working space, you could always rent a studio or work from a shared studio space. And let’s also not forget that libraries, cafes and even parks are great places to work from that provide you with an office space outside the home. Running a business means you wear a million hats, which means a never ending to do list. As I mentioned before, having a daily schedule and setting boundaries will help when it comes to preventing you from working all day and night. But when you’re trying to grow a business, sometimes there are things that just need to get done. While you could do it all yourself, you’ll save your sanity by getting help. Hiring someone to do those tedious, time consuming tasks can help you breathe easier because 1) they’re getting done and 2) it’s one less thing on your plate. Outsourcing means it’s easier to stick to those boundaries and prevent burnout. So what can you outsource? Think of tasks that you yourself don’t need to complete. Things like bookkeeping, social media management, and WordPress development. Tasks that you hate doing or that take too long to do. Even getting just one task off of your plate can make a huge difference in your work/life balance. Psst… if you’re a designer who is looking to outsource development, let’s chat! Also, don’t discount getting help at home. Hire someone to come clean your house. Order your groceries and have them delivered. Anything that makes your life easier is worth it! How do you create a work / life balance as a small business owner? Share your tips in the comments!